For those looking to improve the security of your home, a security door is a wise investment. There are many benefits to getting security doors installed other than keeping out intruders and protecting your family. If this is your primary goal then a security door is a smart place to start. Not only are they your first line of defense against intruders but they can also offer other advantages depending on the style and type of materials you choose. 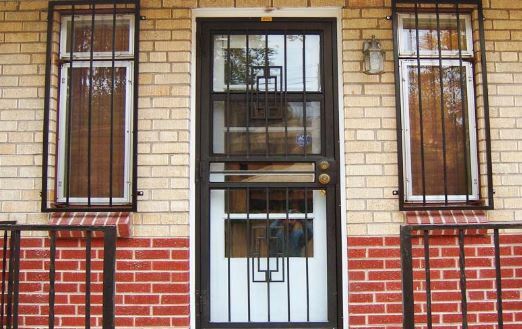 Security doors have strong and sturdy frames which are often made of steel or iron which make the doors far more secure than standard exterior door frames typically made of wood or plastic. Not only does having a security door and external stainless steel screen door make it very difficult to break into, they also last a long time. Visibly having a security door installed alone can make a strong statement can deter criminals from even attempting to mess with your home. When intruders see security doors they will immediately think of the increased difficulty and risk involved which are both strong deterrents when they can just find an easier, more vulnerable home to break into. It’s also advisable to make the windows around or close to the door shatterproof or have metal window security bars. Another benefit of security doors is that they also add value to your home, protecting your investment while also increasing it in value. You can also save money on your home insurance policy and last for decades meaning you won’t have to worry about replacing them for a long time. Beckworth LLC would love to come and go over the different options you have security doors for your Virginia home. We will make sure you get the material and style that best suits your needs, home and budget so you can rest easy knowing your home and family are safer because if the investment and improvements you make to your house.